The unknown killer struck five times and theories about his identity abound: he was either a cricketer (Montague John Druitt), a prince (Albert Victor, Duke of Clarence), a cotton merchant (James Maybrick), a Jewish slaughterman (unnamed), a confidence trickster (Michael Ostrog), a former lover (Joseph Barnett), a directory compiler (Thomas Cutbush), a hairdresser (Aaron Kosminksi), one of three surgeons (Sir William Withey Gull, Oswald Puckeridge or Vassily Konovalov), a killer (James Kelly), a plumber (Frederick Deeming), a poisoner (Dr Thomas Neill Cream), a cobbler (John Pizer aka “Leather Apron”), a painter (Walter Sickert), a quack doctor (Francis Tumblety), a philanthropist (Dr Thomas Barnardo), a shopkeeper (Edward Buchan), a military historian (Sir George Arthur), one of four doctors (“Dr Stanley”, Dr Cohn, Frederick Chapman or John Hewitt), Cambridge University fellow (James Kenneth Stephen), a journalist and sacked doctor (Robert Donston Stephenson), an insurance salesman (G. Wentworth Bell Smith), a coroner (Dr William Wynn Westcott), a butcher (Jacobs), a sawdust seller (William Henry Bury), a former soldier (William Grant Grainger), a vagrant (Alfred Gray), a traveller (Frank Edwards), a barber (Severin Klosowski aka George Chapman), a hairdresser (Charles Ludwig), a landlord (John McCarthy) and even a woman (Olga Tchkersoff). The first victim, Polly Nichols, was last seen alive, drunk, at 2.30am on 31 August 1888 on the corner of Osborne Street and Whitechapel High Street. She had been turned away from a doss house because she didn’t have the requisite 4d. She told the landlord, “I’ll soon get my doss money, see what a jolly bonnet I have now.” At 3.45am her corpse was discovered. Victim number two, eight days later, was “Dark Annie” Chapman. Discovered shortly before 6am in the rear yard of 29 Hanbury Street, her dress was pulled up over her knees and her intestines lay over her left shoulder. Her throat was cut deep to the spine and there were two cuts on the left side of the spine. On 30 September the Ripper struck twice and “Long Liz” Stride and Catherine Eddowes died. Eddowes had been disembowelled and a piece of her ear, her left kidney and part of her entrails were missing. The final victim was Mary Kelly, the youngest and the only one to die indoors. She was mutilated beyond recognition. More than 120 years later, we are no nearer to knowing his true identity. 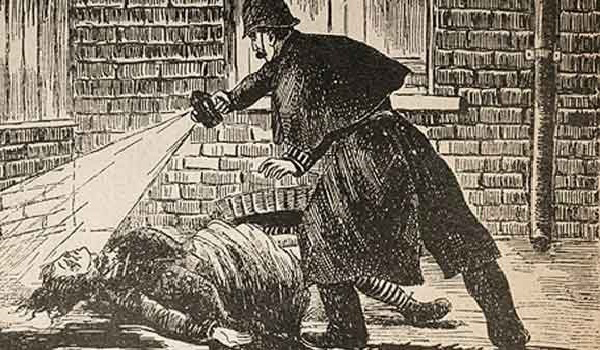 The name “Jack the Ripper” was almost certainly invented by a journalist.